Parking: Car park on Kendal to Underbarrow road approximately one and a half miles out of Kendal. Following the road from Kendal, there is a car park on the right-hand side of the road, near to a large aerial mast. Past this just over the brow of the road, and again on the right-hand side, there is another car park signed Scout Scar Car Park, from where the walk starts (grid reference SD 487 924). This is an excellent walk for those only wanting a short stroll, but yet wanting excellent panoramic views. The walk can also be extended either by starting in Kendal town centre and walking out to the Scar or by walking further along the Scar to Burnbarrow Scar and then returning by the Brigsteer road before turning left over Bradleyfield to return to Scout Scar. 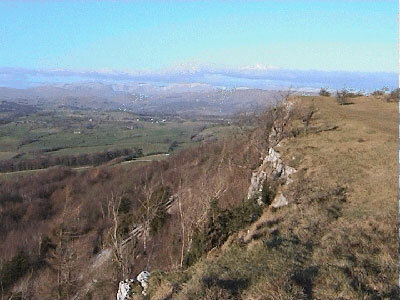 Scout Scar itself is a long limestone escarpment. Leave the car park, turn right, cross over the road and enter onto the Scar through the metal kissing gate. Once through the gate, head up the well-worn path that leads off diagonally to the right. The path then flattens and turns left to run along the edge of the Scar. Even after this short few minuets walk, there are already excellent panoramas across to the Lakeland hills over to the right (North and West). Looking around at the more dominant peaks on the skyline from the West to the North are: Caw; Coniston Old Man; Swirl How; Wetherlam; Crinkle Crags; Scafell Pike; Bowfell; Great Gable; Langdale Pikes; High Raise; Ullscarf; Great Rigg; Fairfield; Ill Bell; High Street; Kentmere Pike; Shipman Knotts and Branstree. After about quarter of a mile, divert from the path along the edge of the Scar to a mushroom shaped shelter a few yards over to the left. This shelter, originally erected in 1912, used to have a schematic layout of all the surrounding hills, but unfortunately most of this is now illegible due to weathering and vandalism. Leave the mushroom shelter and return to the path by the scar edge. Continue along this along the wide path for a further half of a mile until the path passes the end of a stone wall. Turn left just past the wall and follow the path up the far side of it for the one hundred or so yards up to the triangulation point (reference OSBM65672 - 229 metres high). From here the views beyond the triangulation point are dominated by the Howgills, with Ingleborough also visible further south. For an extended walk simply walk further down the Scar towards the Kent estuary and retrace your steps back to this point. From the triangulation point, go through the gap in the wall nearby and follow the path back to the road which runs parallel with the outgoing path, this time going past the other side of the mushroom shelter. Just before reaching the road, pass through the metal kissing gate, turn right onto the road and walk the final few yards back into the car park.